"Affordable Canadian pharmacy for Americans"
to provide convenient, affordable Canadian prescription benefits to those who currently have no prescription coverage or who have inadequate prescription coverage in the United States. We strive to be a leader in the industry for providing the Canadian discount drug services with superior customer service. Why are Canadian prescriptions so cheap? The Canadian government regulates the cost of prescription drugs based on the manufacturer's costs of production. One example of this principle is Tamoxifen or Nolvadex (AstraZenica). The price of the generic or brand of this prescription drug is THE SAME. This is mandated by the Canada Health which is similar to the FDA in the United States. Canada also ensures that a manufacturer's prices are not inflated by advertising budgets. Many of you have seen Television advertising for prescription drugs in the United States for such drugs as Celebrex, Nexium and more. The cost associated with advertising a prescription drug is directly proportional to the cost in the United States versus the cost in Canada. When purchasing a Canadian prescription drug in Canada, you are only paying for the manufacturer's cost, the pharmacy markup, and shipping. It is that simple! Don't let the pharmaceutical companies fool you! Learn more about the price controls which regulate the cost of Canadian prescriptions. We facilitate the review of your prescriptions and your medical health by a licensed Canadian physician and forward all prescriptions to OUR affiliated licensed Canadian pharmacy to be filled. 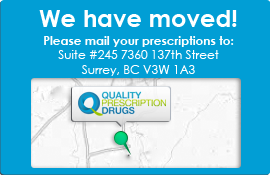 Our pharmacy ships the prescription via Canada Post directly to your house or post office box! It is that simple! Do you want to know more about Canadian online pharmacies? Visit our canadian online pharmacy information page.